14 cm 256 p. : col. ill. Previous ed. : published as Moroccan Arabic by Dan Bacon, Bichr Andjar and Abdennabi Benchehda. 2008. 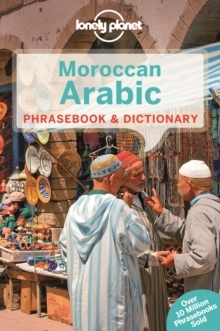 Lonely Planet: The world's leading travel guide publisher With Lonely Planet's Moroccan Arabic Phrasebook, let no barriers - language or culture - get in your way. Our phrasebooks give you a comprehensive mix of practical and social words and phrases in more than 120 languages. Chat with the locals and discover their culture - a guaranteed way to enrich your travel experience. Order the right meal with our menu decoder Never get stuck for words with our 3500-word two-way dictionary We make language easy with shortcuts, key phrases & common Q&As Feel at ease, with essential tips on culture & manners Coverage includes: Moroccan Arabic, Berber, French Authors: Written and researched by Lonely Planet, Dan Bacon, Bichr Andjar, and Abdennabi Benchehda. About Lonely Planet: Started in 1973, Lonely Planet has become the world's leading travel guide publisher with guidebooks to every destination on the planet, as well as an award-winning website, a suite of mobile and digital travel products, and a dedicated traveller community. TripAdvisor Travelers' Choice Awards 2012 and 2013 winner in Favorite Travel Guide category 'Lonely Planet guides are, quite simply, like no other.' -The New York Times 'Lonely Planet.